Google launched the World Wonders Project on Thursday, a new site that gives users the chance to see ancient and cultural sites around the world up close. Google’s Street View has proved to be an invaluable tool for those people curious about the world beyond their front door. Since its launch five years ago, the service has traveled the world mapping roads, railways, parks, airports, malls and even parts of the Amazon basin. And now the company has given us yet another excuse not to venture from the confines of our cosy couch with the introduction of a new feature: the World Wonders Project. Announced on Thursday in a post on the Mountain View company’s official blog, the project offers up 132 ancient and cultural sites spanning 18 countries. The World Wonders Project uses Street View technology to allow users to get an up close view of the locations, which include the UK’s Stonehenge, archaeological areas of Pompeii in Italy and ancient temples in Japan’s former capital, Kyoto. Some nice little bonuses come with Google’s new offering. 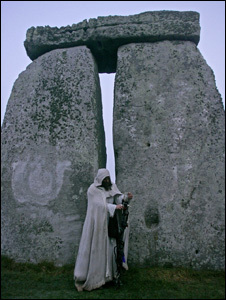 Its Stonehenge pictures, for example, take you right in among the stones — something you can’t do if you visit in person, as a rope cordon around the ancient monument has been in place for the last 35 years. “Most could not be filmed by car, so we used camera-carrying trikes to pedal our way close enough,” Melanie Blaschke, product marketing manager of the World Wonders project, explained in the blog post. To enhance the experience, the site offers 3D models and YouTube videos relating to each location. Google hopes World Wonders will prove particularly popular with students and scholars, and has even put together a number of educational packages for use in the classroom. So if you feel like enjoying some of the world’s ancient sites without actually having to physically travel to them, or if time and money are a bit on the tight side just now, the World Wonders Project could be well worth checking out.